Not your mother's trash pile. Want to save money and create a thriving landscape, all while reducing your emissions footprint? 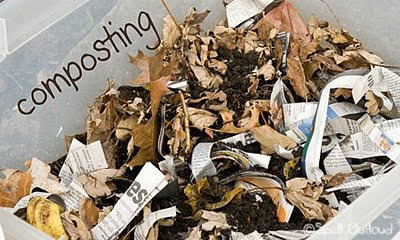 Composting, the recycling of your organic trash through decomposition, is not only one of the easiest ways to reduce what you are sending to the landfill, but also a method of creating your own fertilizer. What do you do with the cotton sock that lost its partner, the silk tie that’s become threadbare or the leather wallet that’s no longer functional? Throw it onto the pile! Leather, cotton, wool, silk, hemp and any other clothing made from organic materials or natural fibers can be composted. Shredding larger items will aid the decomposition process. You will finally have a place to recycle the doll-sized sweater that you shrunk in the dryer. By the way, you can also compost dryer lint. This one sounds yucky, but it works. Just remember, a compost pile should be kept moist, not sopping wet. No human excrement should be composted; however, vegan poop is supposedly ok. Potty training parents can empty their children’s pee buckets in the backyard, and if you are busy working in your yard when nature calls, you can try this one out for yourself. Another source of compost gold from the bathroom is used Q-tips and cotton balls. The Q-tips need to be 100% cotton, with a cardboard stick. When you’re in the bathroom, you might want to gather up any used Kleenex, toilet paper tubes or cardboard tampon applicators—all compostable products. Paper vacuum bags and their contents are fully compostable. Sturdy vacuum bags may need to be shredded before they are added to the pile. Anything you have vacuumed up that is not dust or dirt related, like pennies or the odd earring, will not, obviously, compost. Whether you are a pet owner, or a dog groomer, you can add any type of animal fur to your compost pile. People hair works, too. From hairbrush pickings to whiskers, it can all be composted. Once you try composting, it can become a strange addiction. Finding new items to compost is a fun, and environmentally-friendly challenge. Check out your composting knowledge with this composting quiz from the Discovery Channel. If you are a new composter, and would like to get started today, try the EPA’s guide to composting. This post is linked to Sorta Crunchy for Your Green Resource. Alexis is a stay at home mom, devoted recycler and freelance writer. She loves to write on mom and baby related topics including tips for how to get pregnant fast and environmentally friendly ideas for new moms.